I haven't done a favourites post (or any other post) in a while so I thought I'd write about some of the items I've been falling in love with. To start it off I wanted to talk about a haircare product that has been saving me during these winter months. I've always been an advocate for healthy hair over pretty hairstyles. There is nothing that I love more than lovely soft and smooth hair. I've been looking for a leave-in product that doesn't leave my hair oily and makes me want to wash my hair. Lately it's all about oils and I have tried them all! This product is creamy instead and I put it in right after my shower. My hair has never been healthier! I've always had hormonal acne and this has been fixing it especially when I'm stressed out. I love using this at night as a cleanser and in the shower as a mask while I condition my hair. My skin has been feeling softer and I've been having less breakouts. Honestly I went to Mecca in dire need of something that worked for the pimples that did pop up and they gave me an answer. This buffering lotion is exactly what my skin needed. It's gentle enough for it to work but it doesn't dry me out and leave me feeling worse than before. It's perfect for under make-up and doesn't leave any marks on your skin. I loved this show! I've made my family watch it and some work people too! I've always been a fan of sci-fi flicks and this was perfect. It wasn't too much to watch after work when you're tired and just want something to watch while you veg-out for a while. I highly recommend watching this! Now can they please bring out season 2?! 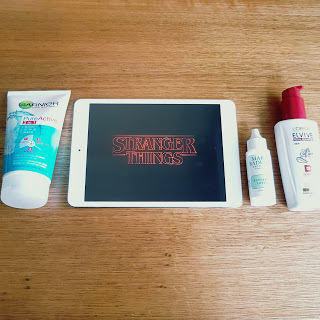 These are just some of the things I've been loving in July now what have you been in love with and please let me know what your opinion of Stranger Things is!! !